You are here: Home / Featured / Amazing Spider-Man #8 Review! Edge of the Spider-Verse with Ms. Marvel! Amazing Spider-Man #8 Review! Edge of the Spider-Verse with Ms. Marvel! This is it, the last part of Edge of Spider-Verse before we crawl from the edge to smack dab in the middle of Spider-Verse proper. This issue contains the resolution of Spider-Man’s team-up with the new Ms. Marvel, Kamala Khan, that began in Amazing #7. It also contains the final Edge of Spider-Verse tie-in featuring the MC2 May “Mayday” Parker Spider-Girl, and it’s a doozy. Please keep your arms inside the emotional rollercoaster at all times for the duration of this issue. In the main feature, Spidey and Kamala are battling Dr. Minerva, a Kree warrior who is bent on stealing a Terrigenesis cocoon similar to the one Kamala got her powers from and taking it back for the benefit of the Kree empire. The teenage Ms. Marvel is a bit awestruck at the chance of getting to team-up with her friendly neighborhood Spider-Man, and it’s all Spidey can do to keep her focused on the battle at hand. There’s a lot of fun action in this story, and readers unfamiliar with Kamala get a good primer on what she does and what her personality is like. 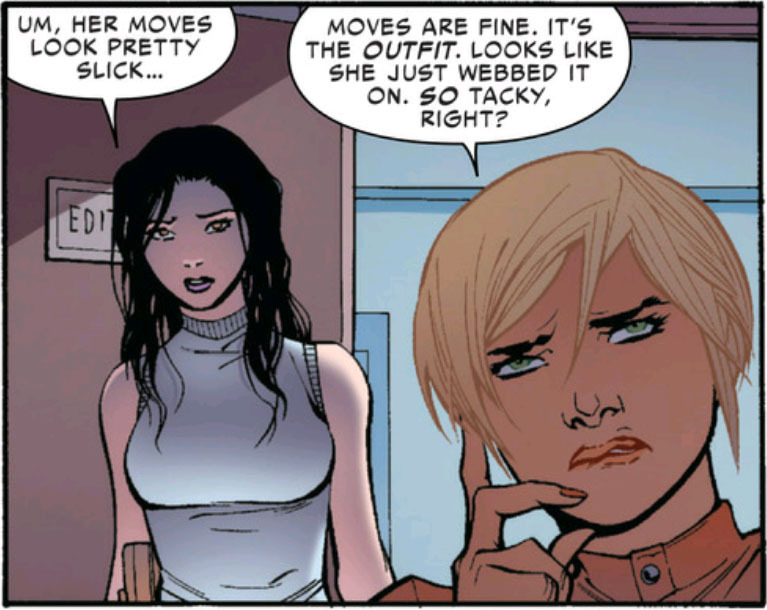 There’s also a side-plot involving Cindy Moon, who is the new hero Silk. We see her at her new job at the Fact Channel and she stops a diamond robbery, but mostly this story is an excuse to get her into her new, more marketable costume. Despite the fact this seems to be the only reason for this plot to exist, you’d think we’d get a better explanation of where she got the new costume in such a short amount of time. Her boss was critical of the fact that the old look was just ‘webbed on’ and ‘tacky’ but then we see her do the exact same thing with the webbing but with different results. Unless she somehow had time to go to a tailor and then stopped the slowest diamond robbery in history, I’m not sure how that was supposed to work. After that fun, fairly light-hearted story, we get to the Edge of Spider-Verse back-up where we see Spider-Girl and her family being attacked by Daemos, one of the members of The Inheritors who are trying to ‘eat’ all of the spider totems throughout the multiverse. I don’t know how fans of Mayday Parker will react to this story, but without giving too much away, this tie-in has a major impact on her status-quo. It fits in nicely with the rest of the Edge of Spider-Verse up to this point, ramping up the stakes for all the various versions of Spider-Man, but in this book it represents a hard tonal shift. It’s dark, and it might have worked better in one of the other tie-in books. If you are a fan of Spider-Girl you should probably read this for yourself. Dan Slott plotted the main story and wrote the backup, with the scripting duties on the main feature falling to Christos Gage. The dialogue is quippy and humorous like you’d expect from a Spider-Man story, with some genuinely good character moments for Ms. Marvel. Spider-Man recognizes a little bit of himself in the new teenage hero, and there is a nice bonding moment between them when he acknowledges the similarities they share. There’s also a great example of Peter Parker’s role as a hero in his civilian life that once again reinforces the theme of responsibility. While I’m not as familiar with Spider-Girl, there is no messing around in the intense few pages of the back-up. If the main story is an episode of a Saturday morning cartoon, the back-up is the opening minutes of Saving Private Ryan. 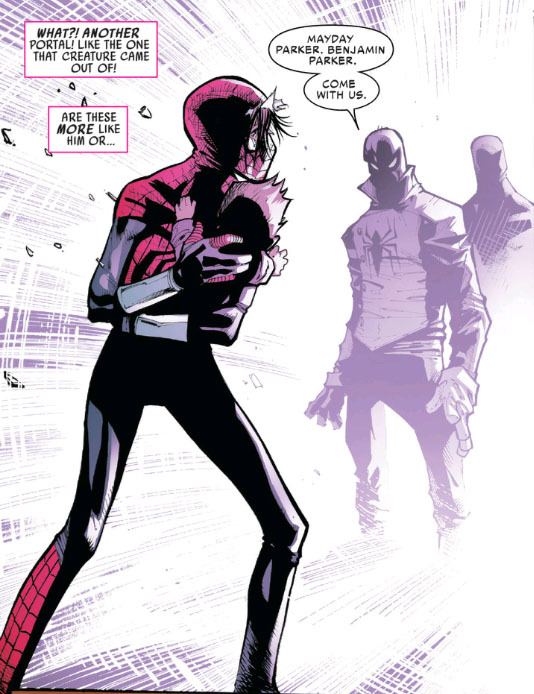 Even if this is your first time reading a Spider-Girl story, as it was for me, it’s still going to punch you right in the feels. Giuseppe Camuncoli’s art in the main story is well suited for what it is, a fun action romp. 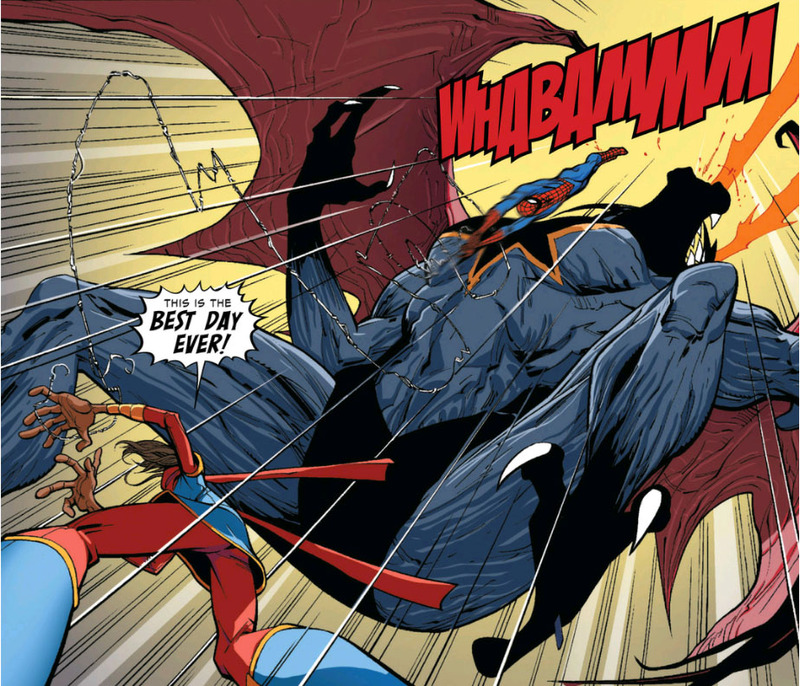 The set pieces are dynamic and do a good job showing off how Kamala’s powers work. The action is exciting and easy to follow. The back-up is drawn by Humberto Ramos, and he turns in his usual excellent work, though to be honest I would have rather he drawn the main feature. He gets mostly closeups of faces, and he does an admirable job conveying the range of emotions on display here. As a standalone Spider-Man comic, this is not an especially remarkable one. It’s the second of a two-parter that fans of Spider-Man and the new Ms. Marvel will enjoy. And that tie-in may be a must read for fans of Spider-Girl, but both stories would have benefitted from being separated. The tonal dissonance was a bit jarring. Nevertheless, it will get you excited for Spider-Verse which starts in Amazing Spider-Man #9 in two weeks.